Simply type a keyword or short sentence relating to your query into the box below, and our FAQ system will return the most relevant answers. Our standard delivery charges are calculated at checkout and are based on the overall cost of your purchase. Orders placed after 4pm Thursday or on a Saturday or Sunday will be delivered on the following Tuesday. Not available for remote postcodes or to PO Boxes. Available delivery options are calculated at the checkout when placing your order. We know it can be frustrating when you’re not in to accept a delivery. Whilst our delivery partners always provide options to either re-deliver or pick up from a local Post Office we know that Click and Collect is an increasingly popular option. We're working hard to introduce this to Cadbury Gifts Direct and soon you’ll be able to select a collection point close to you. We’ll update this page as soon as this service is available. SENDING A GIFT OUTSIDE OF THE UK? Well who can blame you, the great taste of Cadbury chocolate has the power to transcend many borders and is enjoyed the world over. 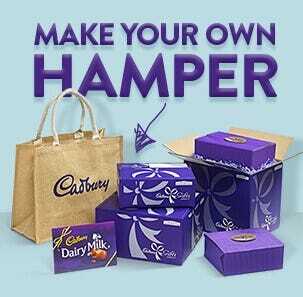 All deliveries from Cadbury Gifts Direct and Cadbury Gifts Direct for Business start in the UK. We’ll try our very best to arrange international deliveries for all orders but please be aware that different delivery charges apply along with extended delivery times. Full details can be found here. Please don’t let remoteness hold you back but you should be aware that delivering to remote postcodes can delay delivery of your order, sometimes by one or two days. An estimated delivery date will be given at checkout. Whenever we spot postcodes in areas such as the Highlands and Islands of Scotland or Northern Ireland we always try and select the best delivery partner (using either a courier or Royal Mail) for that area to ensure delivery can be made as quickly as possible. We offer international delivery on telephone orders. To place your order please contact our customer services team on 0845 600 3113.
International delivery charges apply along with extended delivery times. In addition, local restrictions may apply. If your gift weighs more than 5kg’s and is delivered to an address outside of the EU, it may be subject to local custom charges or additional delivery charges. Should this be the case, a member of our team will contact you before the order is accepted and despatched from our warehouse. Cadbury Gifts Direct is unable to take responsibility for the actions of local customs; courier or postal systems operating in the country of destination; nor changes in temperature during transit which may have a detrimental effect on the gift being transported. Consequently, Cadbury Gifts Direct is unable to accept liability if your order is delayed or damaged during delivery and by placing your order, you accept that local customs may also levy additional local taxes. We’ll try our very best to arrange international deliveries for all orders. However please be aware that different delivery charges apply along with extended delivery times. In addition, local restrictions may apply. If your gift weighs more than 5kg’s and is delivered to an address outside of the EU, it may be subject to local custom charges or additional delivery charges. Should this be the case, a member of our team will contact you before the order is accepted and despatched from our warehouse. We hope that you will be pleased with your order. In the event that there is a problem with your order, including shortages, damages or your order being incorrect, please contact us as soon as possible and we will do our best to put things right. Replacements can only be made within 28 days of receipt of goods. In the event a replacement cannot be fulfilled, or at your option, it may be necessary for us to issue a refund. Where a refund is necessary, it will only be issued to the original purchaser's card used to place the order. The refund will be made once the goods are returned. Under the Consumer Protection Regulation you also have the right to cancel your contract and obtain a refund within 7 working days, beginning the day the goods are delivered to you. If you have paid delivery charges, these will also be refunded to you but if you only wish to return part of the order, then we are not obliged to reimburse delivery charges. You must take reasonable care of the goods whilst in your possession. In the event that the goods are not returned to us in fully resaleable condition, we reserve the right to refuse all or part of your refund on the order. You must inform us of cancellation of contract as soon as possible within the 7 working day period allowed. Please contact our Customer Care Team on 0371 664 2373 or email info@cadburygiftsdirect.co.uk if you need any further information or assistance. Please note that Personalised Sleeves cannot be changed, modified or cancelled once the order is placed. In the event that you would like to cancel and return your personalised order, we will only be able to refund the sale value of the chocolate, provided that we are notified of your wish to cancel within 7 working days. This does not affect your statutory rights. Replacements can only be made within 28 days of receipt of goods. If a refund is necessary, it will only be issued to the sender's card - i.e. the card used to purchase the goods in the first instance; and will not be made until goods are returned. Help - my gift hasn't arrived when it should have. We use a combination of Royal Mail and DPD Local Couriers to deliver all of gifts and in the vast majority of cases our delivery partners perform an amazing job with parcels arriving on time and in the right place. But .. we don't suppose you'd be looking at this page if you weren't concerned about your own delivery so here's what we can do to help. Firstly, please check your order confirmation email - this has important information about the requested date of delivery and the delivery address supplied. Please check these details first, it is possible the incorrect details may have been entered at the time of sale. Depending on what you've purchased, the confirmation email may also contain a tracking link to our courier. From here you'll be able to track the progress of your order and retrieve information about its whereabouts. If you order confirmation doesn't contain a tracking link then you can contact us by email at info@cadburygiftsdirect.co.uk or by phone on 0371 664 2373. Our phone lines are open Monday to Friday 9am to 5pm and Saturdays 9am to 12.30pm (GMT). Please be sure to include your Order Reference number in any communication to help us quickly identify your order and assist with providing information on its whereabouts. For information, we don't list products on Cadbury Gifts Direct which are out of stock so any delays in delivery are never down to an 'awaiting stock' issue. Likewise, all deliveries are made from within the UK. To search type in the name of the individual product. At Cadbury Gifts Direct we try as hard as we can to make sure the information about the products we sell is always as accurate as possible. However, because products are regularly improved, the product information, ingredients, nutrtional guides and dietry or allergy advice may occasionally change. Why does Cadbury Gifts Direct Look so different? Welcome to our fresh new website - we hope you like it. We've worked hard to create a site that is not only easy to use but one that allows you to fully explore the delicious Cadbury chocolate products we have on offer. We're particularly proud of the enhanced personalisaton section where you can customise Dairy Milk and Milk Tray sleeves with the names and photos of loved ones, friends and colleagues. Please take time to enjoy your visit to Cadbury Gifts Direct and if there's something you love; or maybe something you're less keen on, then we'd welcome your feedback. 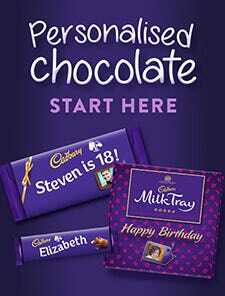 What if I have a query or comment about Cadbury products or services, not supplied by Cadbury Gifts Direct? Query on cadbury products not bought from Cadbury Gifts Direct? How quickly will my goods be delivered? You can choose to have your chocolate gifts delivered next working day. Please note this service is only available on orders placed before 3pm (GMT) Monday to Friday and is applicable to UK mainland only (excluding Highlands & Islands, Northern Ireland and Channel Islands). On all other orders you should allow between two and four working days for delivery although most orders arrive before this. We do not deliver on a Saturday or Sunday. At peak delivery times such as Christmas and Easter normal deliveries may incur delays and we would advise that orders placed for special occasions are made in good time. You may also choose to deliver on a specific date in the future. This can be really helpful when you want to be prepared inyour gift buying. It is particularly useful for Christmas, Birthdays and Easter. Just choose your specified date at the checkout. You will receive an order confirmation when you place the order and then a dispatch email the day it leaves the warehouse for your chosen date. Cadbury Gifts Direct is committed to ensuring that your privacy is protected and that we fully comply at all times with the Data Protection Act 1998 and the Privacy and Electronic Communications (EC Directive) Regulations 2003. When you order or enquire about our products we need to know your name, address, email address, and, if ordering, your credit card number and expiry date. If you have ordered products for a third party we will need to know their delivery address. We gather this information to allow us to process your registration and process any orders you may make. The relevant information is then used by us, our agents and sub-contractors to organise delivery, provide you with statements of your account and to communicate with you on any matter relating to the conduct of your account and the provision of our service. We may also use aggregate information and statistics for the purposes of monitoring website usage in order to help us develop the website and our services and may provide such aggregate information to third parties. These statistics will not include information that can be used to identify any individual. From time to time we may provide your information to our customer service agencies for research and analysis purposes so that we can monitor and improve the products and services we provide. We or our agents and sub-contractors may contact you by mail, email or telephone to ask you for your feedback and comments on our products and services. Some of these cookies are essential for you to use cadburygiftsdirect.co.uk To order products on our website you will need to have cookies enabled. Security is a major issue for anyone purchasing on the internet. You need to know that a website is legitimate, and transactions are secure before you buy. Our secure server software uses the digital certificate to encrypt your credit card number. The encryption process takes the characters you enter and converts them into bits of code which are then securely transmitted over the internet. We also keep your information confidential. The internal procedures of Cadbury Gifts Direct cover the storage, access and disclosure of your information. How can I buy a gift card for Cadbury Gifts Direct? Give the gift of choice with a Cadbury Gifts Direct e-gift card. Perfect for those last-minute presents, the Cadbury Gifts Direct e-gift card can be used to buy anything on the site, including delivery. The person receiving the card will enjoy choosing from our extensive range of terrific gifts and can have them delivered to the door next day. You can choose your own e-Gift card value from £10 upwards. Once purchased, Cadbury Gifts Direct e-Gift card codes are valid for 3 years. To purchase an e-giftcard, simply click here. Fill in the details, including the email address you'd like the e-gift card sent to and add the card to your basket and checkout. Your intended recipient will receive the email within a few minutes of your order being completed. Our standard delivery charges are calculated at checkout and are based on the overall cost of your purchase. If the total price of the goods you have bought is £10 or below then delivery is charged at £3.95. If the total price of goods bought is over £10 then the delivery charge is £5.50 in the UK. Delivery oversees cost depends on where you would like to send - just choose the country in the drop-down at the checkout and it will indicate the cost. At checkout you will be given the option to upgrade to a next working day delivery (available on orders placed Monday to Friday before 4pm GMT/BST) which costs £6.50 (UK mainland only). For Highlands & Islands, Northern Ireland and Channel Islands and expedited service is available and an estimated delivery date will be notified at checkout). Please note we do not deliver on Sundays or English public holidays, and Scottish public holidays in the case of deliveries made in Scotland. Do I have to register my details before viewing this site? No, the only time we need to take details from our customers is when they actually make a purchase, ie when they pass through our checkout. If you merely want to browse our chocolate gift range or use some of the site's features then you do not need to register. However once you are registered you will be able to use our 'Fast Track' ordering system on subsequent visits and store addresses you have previously sent to, get all our latest offers and be rewarded with our chocolate chunks. How do I search for the most appropriate Cadbury chocolate gift? 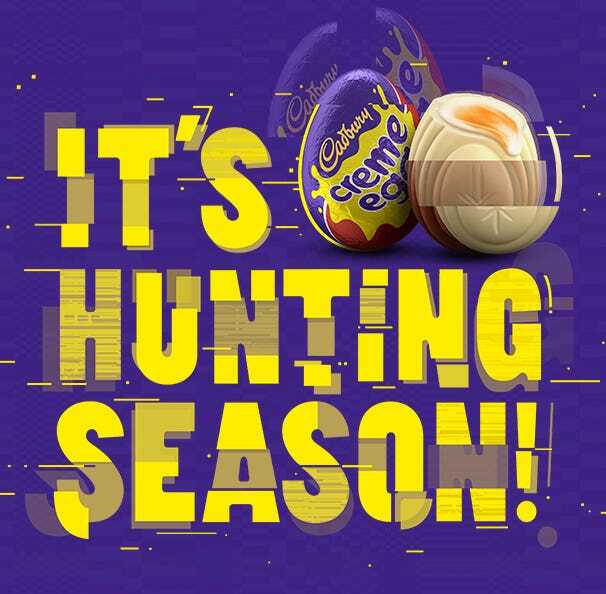 You'll be pleased to know there's lots of ways to search for the perfect gift on Cadbury Gifts Direct. Use the navigation at the top of the screen to filter products by Occasion, Type, Brand, Recipient or Price. Alternatively you can look for inspiration by viewing the full chocolate gift range or choose ' Shop by Product Type' where you can sift our range by gift type - such as Chocolate Hampers or Chocolate and Beer gifts for instance. You can also hunt for gifts in our Seasonal Category or by searching on brand - super if you're passionate about Crunchie or Dairy Milk and want to get to those products quickly. And if you still can't find an appropriate gift then you should try our 'Create your own bespoke hamper' area. This allows you to customise your own chocolate gift combination and save it as a unique product to you. How can I pay for my chocolate gifts? The site accepts payment from all major credit/debit cards including VISA, Mastercard, American Express and PayPal. Our site is fully secure, using a Secure Trading server with state of the art encryption and secure sockets layer (SSL) technology. We do not store your credit/debit card details online. However, if you would prefer not to send your payment details over the Internet you can pay over the phone on the Cadbury Gifts Direct order phone. Call 0845 600 3113 Monday to Friday 9.00 to 5.00pm and Saturday 9.00 to 12.30pm. We also accept payment by Paypal and Checkout by Amazon. What will appear on my credit/debit card statement? Thank you for ordering from Cadbury Gifts Direct. If you have paid using a credit or debit card, 'Cadbury Gifts Direct' will be shown on your bank or credit card statement. If I order several weeks in advance when does my credit/debit card get charged? The full cost of your gift plus delivery charge will be debited from your card as soon as you confirm your online order. 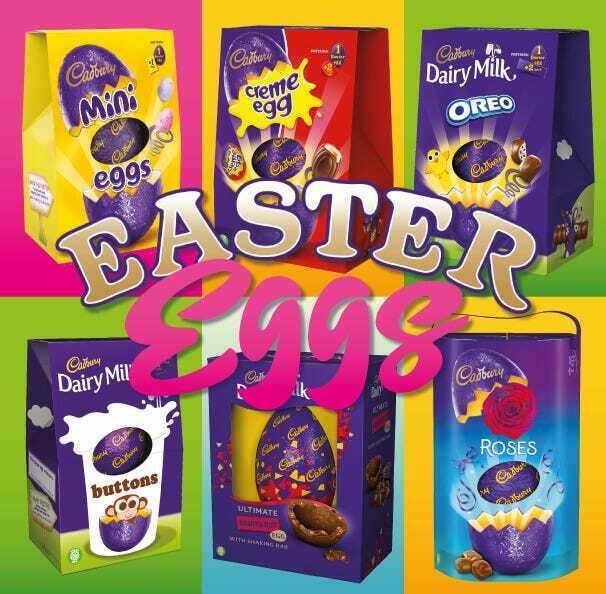 As soon as you place your order you will receive an email from Cadbury Gifts Direct informing you that your order has been received and is being processed. This email will contain your order summary and order number. Shortly before your requested delivery date you will receive another email informing you that your order has been dispatched to your chosen recipient. 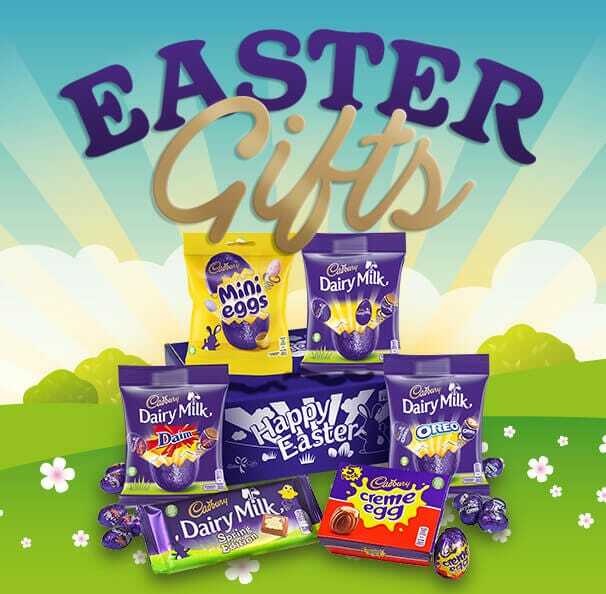 Payment is taken automatically at the time of purchase by Cadbury Gifts Direct. Your credit/debit card statement will read Cadbury Gifts Direct. Orders are subject to acceptance. We reserve the right to decline any order without providing explanation. Cadbury will not be given access to your credit/debit card details. How do I spend by Cadbury Gifts Direct gift card? So you have a Cadbury Gifts Direct e-Gift card code - lucky you! Simply browse the website and add the items you'd like to buy to your basket and go to 'checkout' as normal. On the right hand side of the checkout page (or beneath the checkout summary if you're using a mobile device). 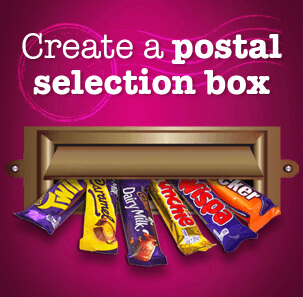 Anyone can use this site to send Cadbury chocolate gifts but delivery is only to UK addresses, the Channel Islands and selected British Forces Post Offices (BFPO) addresses. Gifts containing alcohol cannot be bought by any person under the age of 18 years old; and cannot be sent to anyone younger than 18 years. Gifts containing alcohol are clearly labelled in the product description. We reserve the right to decline an order for gifts containing alcohol if we believe the person ordering or receiving the gift is below 18 years of age. As soon as you place your order you will receive an email from Cadbury Gifts Direct, informing you that your order has been received and is being processed. This email will contain your order summary and order number. You can check the progress of your order at any time by visiting the 'Check my Order' page of our site. Shortly before your requested delivery date you will receive another email informing you that your order has been despatched to your chosen recipient. If you have made a mistake on your order please ring our helpline on 0371 664 2373 (Mon - Fri 9am - 5pm; Sat 9am - 1pm) or email info@cadburygiftsdirect.co.uk and we will do our best to correct it for you. Most Cadbury Gifts Direct deliveries are made Monday to Friday. No deliveries are made on a Saturday, Sunday or Bank Holidays. Orders made over a weekend will be processed on the Monday. Any orders placed over a weekend requiring next day delivery will be despatched for delivery on Tuesday. Gifts from Cadbury Gifts Direct can be sent to any UK address; the Channel Islands and selected British Forces Post Office (BFPO) addresses. Please allow extra delivery time when sending gifts to more remote parts of the UK and outside mainland UK, for instance the Highlands & Islands of Scotland and Northern Ireland. What happens if there is no one in to receive the delivery? Some of our chocolate gift lines are designed to fit through the letterbox and in most instances these will be delivered whether or not someone is at home. Where a Cadbury gift cannot be delivered then these will be returned to the local delivery depot - either a Royal Mail depot or one operated by our couriers. In both instances a card will be left at the recipient address notifying the occupier that a delivery was attempted. Collection details and/or options for a redelivery at a convenient other time will be provided on the card. Gifts that cannot be delivered (incorrect addresses, 'gone-aways', no response from recipient following delivery attempt etc) will be returned to our offices after four weeks. At this point we will notify the sender that the gift has not been delivered. You might want to consider sending your Cadbury chocolate gift to your recipient's place of work if you think they might not be at home to receive their gift. Do your products contain nuts or traces of nuts? Most of the confectionery items featured on this site could contain nuts or traces of nuts. A comprehensive list of ingredients and details concerning the status of Cadbury products (gluten, nut, wheat, Halal, Kosher etc) is displayed in the nutrition and allergy section displayed on the full details of each product. How should I store my gift? All products sold on Cadbury Gifts Direct contain Cadbury confectionery. Your gift should be stored in cool, dry conditions away from direct sunlight and strong odours. Some gifts contain alcohol which should be stored away from children. How does the diary reminder service work? This is a complimentary feature offered by Cadbury Gifts Direct. Log on to the diary reminder service and leave reminders for all the birthdays, anniversaries and special days you might otherwise forget. Decide how soon before the day you'd like a reminder (5 or 10 days) and we'll send you an email at the appointed time. 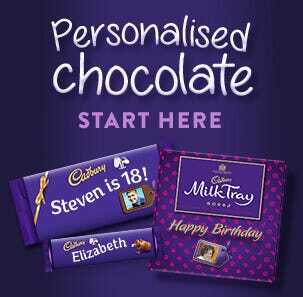 Once you have placed an order on Cadbury Gifts Direct an account will be created for you. You can use this account with your email address to create your own address book in which you can store as many addresses as you wish. You can edit your list at any time and use it to 'Fast Track' the order process when sending chocolate gifts. How does the Pick & Mix feature work? How do I apply for a replacement? Your gift should reach the recipient address in good condition but in the event of damage or breakage it may be necessary to arrange a replacement. If you need to contact us to arrange a replacement please call our customer care line on 0845 6003113 (Mon - Fri 9:00am - 5:00pm; Sat 9am - 1pm), quoting the order number displayed on the gift card. Replacements can only be made within 28 days of receipt of goods. If a refund is necessary, it will only be issued to the sender's card - i.e. the card used to purchase the goods in the first instance; and will not be made until goods are returned to Cadbury Gifts Direct at: Unit 2 Melmerby Green Road, Barker Business Park, Melmerby, Ripon, HG4 5NB. In all instances we will notify the sender that a refund is being made. Can I order larger amounts of chocolate? We are always pleased to hear from companies and organisations requiring larger amounts of chocolate. For more information on corporate chocolate gifts, please see our corporate ordering page or get in touch with the corporate team here . Contact us by using the form in our contact section or phone us on 0371 664 2373. Our postal address is: Cadbury Gifts Direct, Unit 2 Melmerby Green Road, Barker Business Park, Melmerby, Ripon, HG4 5NB.